The weather appears to have set in here in Sydney and from what I am hearing - in other places both north and south of the state. The cooler weather provides the perfect introduction to some great warming cider recipes. Mulled wine is one of my all time favourite things during the cooler months and this apple cider version speaks for itself. 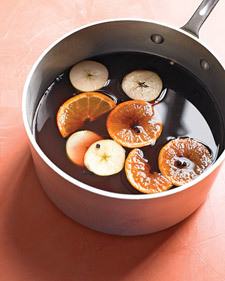 Combine apple cider, wine, maple syrup, peppercorns, cloves, orange and apple(s) in a medium saucepan. Gently simmer over medium-low heat for 10 minutes. Serve warm, in mugs. I'd love a mug of that tonight! Even though they're saying that it was warm today, I felt a chill! Thank the good lord the weather is FINALLY cooling down now. I made this once with a few friends with straight red wine but I'm really feeling the combination of both wine and cider, can't wait to try it sometime soon.